All plants require water to survive, but some plants “drink” less water than others. Certainly, there are plants that grow in a lack of water. They are the best drought-tolerant plants that can live without water for an extended period of time. Lithops are exceptional stone-like tender plants, so they are also called “living stones.” They are suitable houseplants since they can go on and on with very low watering. That’s what urban busy people need: a little attention to pay to get beautiful flowery plants and a lot of water to save for that water supply bill! Agaves store water in their absorbent thick foliage just like camels store water in their hunchbacks. They also sprawl their roots deep below the soil top to collect the water available. The leaves of agaves have sharp pointed edges whereas some agaves have pin-like leaves in order to keep water inside the plant. Landscapers often use agaves, attracted by the myriad of interesting shapes of their foliage, by the low care needed for them, and, of course, by agave’s drought-tolerant ability. The bougainvillea is a ‘crowned champion’ in tolerating dry climates across the world. It seems to be one of the most resistant shrubs that thrive neglected in extreme and intense weather conditions. This colorful plant is quite easy to grow as well. The portulaca, aka “moss rose,” is able to grow in water scarcity, and even in poor soil. Thanks to its thick juicy succulent leaves, it can survive for a long time while deprived of water. As you can see in the picture, it comes in a great variety of wonderful radiant colors. On the one hand it is a water-frugal plant, but on the other hand, it requires plenty of warmth to thrive. 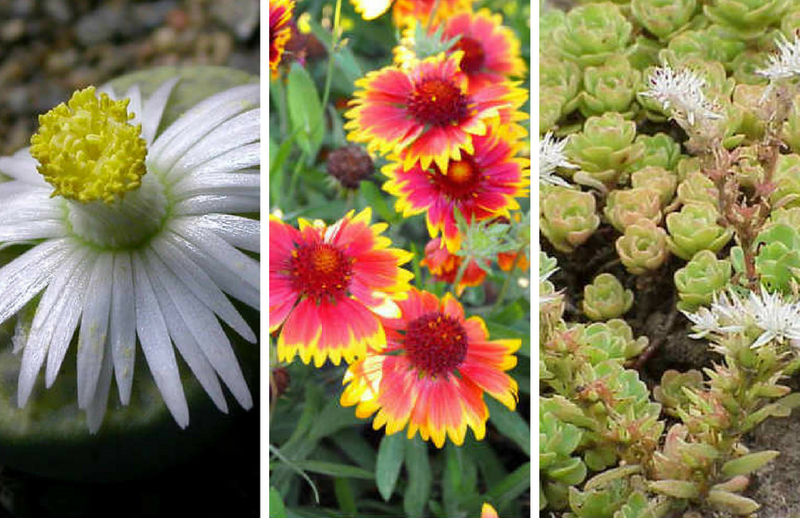 The blanket flower has no special needs when it comes to watering. Anyone can make it bloom prolifically, without a ‘green thumb.’ All it really needs is a sunny spot and occasional watering spells. It blooms all summer around, and even in the fall. It is feasible to grow this plant in both cold and warm tropical climates (USDA Zones 3-10). The gentle looking verbena has also developed an ability to be stingy-mingy with water. It makes an adorable ground cover that can become viral in dry gardens and front lawns alike. It thrives in high heat, and with just a little rainwater. It comes in a lot of eye-catching pastel colors, and blooms in clusters from spring to fall (or year around in warm climates). It wants full sunlight and well-drained soil. The verbena grows diversely in both temperate and tropical climates under USDA zone 3 to 11. The lantana is a hardy tropical plant, full-fledged for its fragrant colorful flowers. It mainly blooms throughout the spring and summer seasons, but, in warmer areas, it produces flowers year around. The lantana tolerates heat and drought, and can be grown in any soil type. Its fragrant flowers attract all sorts of butterflies which vigorously pick up the lantana’s lively colors on their spidery wings, busy honey bees, and ‘footloose and fancy-free’ hummingbirds. This plant is also easy to grow in decorative planters. It grows well in USDA zones 7 to 11. It is appreciated for its beautiful purple leaves and sweet aroma. The wallflowers are short-lived perennials in warmer regions (USDA Zones 8-10), others are annuals (in colder regions), or biennials that are well-resilient to drought, and require occasional water splashes. First clustery flowers appear in early spring and summer. You ought to put your wallflower plant in a sunny corner, or in a partially-shaded spot. Remember not to water it much as it does not need it. The oleander is a tropical-borne shrub that blooms bountifully. It bears beautiful fragrant flowers in different colors, mostly in light pink, then yellow, red, white, and purple. The oleander is known to adapt well to hot and arid climates, and grows very well in coastal areas. It prefers full sun, but generously ‘welcomes’ a few hours of shade during the day. The rock soapwort is dubbed as “tumbling Ted.“ It is a good semi-evergreen groundcover that blooms in summer time. It is a native shrub to the mountainous regions of the Southern Europe. It is relatively cold- friendly, and does not grow well in hot climates (above zone 9). You can readily grow this plant if you are looking for one that thrives on negligence, requires no fertilizers, and does not mind if the soil is poor (that is in the drought-like condition). The sage is a perennial, drought-resistant herbal remedy, famous for its aromatic flavor. The best time to start it is when the weather starts to warm up after the frost melts (or when there is basking sunshine). The sage has low watering requirements, and overwatering can even kill the plant fast! Poppies are the biggest attraction in any garden, or in any patio, due to their vibrant reddish color. If you are keen to grow poppies, all you need is a sufficient sunlight, and low-to-moderate watering. This mound-forming shrub has grey-green foliage, and pretty, button-like flower heads that appear when summer rings its bells. In fact, it is a summer harbinger! You can grow this plant in a well-draining, loamy soil (that is an easily-worked fertile soil consisting of a mixture of clay, sand, and silt, and sometimes also organic matter) in full sun. The sedum is well-known for its good resistance to drought. It suffices to water it once a week in the spring and summer and, if need be, once a month in winter. This plant grows well in all soil textures, and prefers plenty of daylight and sunshine. There are many sedum varieties available in flower shops, and almost all of them are low maintenance ones. You can choose the flowering ones, or those with variegated foliage. Plants of the genus Adenium – commonly called Karoo rose, desert rose, impala lily, Sabi star, or simply adenium – make superb collector’s specimens whether cultivated as dwarfs, or grown into small trees. The adenium, being a tropical moist plant, requires watering only once in a while. It is known that the adenium requires full sun and heat to thrive. Nevertheless, it can also be raised as a houseplant in colder climates.